If we take into consideration the objective facts of religious history, we must place the Old Testament, the Gospels and the Qur'an on the same level as being collections of written Revelation. Although this attitude is in principle held by Muslims, the faithful in the West under the predominantly Judeo-Christian influence refuse to ascribe to the Qur'an the character of a book of Revelation. Christianity has taken the Hebraic Bible for itself and added a few supplements to it. It has not however accepted all the published writings destined to make known to men the Mission of Jesus. The Church has made incisive cuts in the profusion of books relating the life and teachings of Jesus. It has only preserved a limited number of writings in the New Testament, the most important of which are the four Canonic Gospels. Christianity takes no account of any revelation subsequent to Jesus and his Apostles. It therefore rules out the Qur'an. The Qur'anic Revelation appeared six centuries after Jesus. It resumes numerous data found in the Hebraic Bible and the Gospels since it quotes very frequently from the 'Torah' [ What is meant by Torah are the first five books of the Bible, in other words the Pentateuch of Moses (Genesis, Exodus, Leviticus, Numbers and Deuteronomy).] and the 'Gospels.' The Qur'an directs all Muslims to believe in the Scriptures that precede it (sura 4, verse 136). It stresses the important position occupied in the Revelation by God's emissaries, such as Noah, Abraham, Moses, the Prophets and Jesus, to whom they allocate a special position. His birth is described in the Qur'an, and likewise in the Gospels, as a supernatural event. Mary is also given a special place, as indicated by the fact that sura 19 bears her name. The above facts concerning Islam are not generally known in the West. This is hardly surprising, when we consider the way so many generations in the West were instructed in the religious problems facing humanity and the ignorance in which they were kept about anything related to Islam. The use of such terms as 'Mohammedan religion' and 'Mohammedans' has been instrumental-even to the present day-in maintaining the false notion that beliefs were involved that were spread by the work of man among which God (in the Christian sense) had no place. Many cultivated people today are interested in the philosophical, social and political aspects of Islam, but they do not pause to inquire about the Islamic Revelation itself, as indeed they should. In what contempt the Muslims are held by certain Christian circles! I experienced this when I tried to start an exchange of ideas arising from a comparative analysis of Biblical and Qur'anic stories on the same theme. I noted a systematic refusal, even for the purposes of simple reflection, to take any account of what the Qur'an had to say on the subject in hand. It is as if a quote from the Qur'an were a reference to the Devil! A noticeable change seems however to be under way these days at the highest levels of the Christian world. The Office for Non-Christian Affairs at the Vatican has produced a document result. from the Second Vatican Council under the French title Orientations pour un dialogue entre Chrétiens et Musulmans [Pub. Ancora, Rome.]. (Orientations for a Dialogue between Christians and Muslims), third French edition dated 1970, which bears witness to the profound change in official attitude. Once the document has invited the reader to clear away the "out-dated image, inherited from the past, or distorted by prejudice and slander" that Christians have of Islam, the Vatican document proceeds to "recognize the past injustice towards the Muslims for which the West, with its Christian education, is to blame". It also criticizes the misconceptions Christians have been under concerning Muslim fatalism, Islamic legalism, fanaticism, etc. It stresses belief in unity of God and reminds us how surprised the audience was at the Muslim University of Al Azhar, Cairo, when Cardinal Koenig proclaimed this unity at the Great Mosque during an official conference in March, 1969. It reminds us also that the Vatican Office in 1967 invited Christians to offer their best wishes to Muslims at the end of the Fast of Ramadan with "genuine religious worth". The newspapers gave little coverage to the official visit of Cardinal Pignedoli, the President of the Vatican Office of Non-Christian Affairs, on 24th April, 1974, to King Faisal of Saudi Arabia. The French newspaper Le Monde on 25th April, 1974, dealt with it in a few lines. What momentous news they contain, however, when we read how the Cardinal conveyed to the Sovereign a message from Pope Paul VI expressing "the regards of His Holiness, moved by a profound belief in the unification of Islamic and Christian worlds in the worship of a single God, to His Majesty King Faisal as supreme head of the Islamic world". Six months later, in October 1974, the Pope received the official visit to the Vatican of the Grand Ulema of Saudi Arabia. It occasioned a dialogue between Christians and Muslims on the "Cultural Rights of Man in Islam". The Vatican newspaper, Observatore Romano, on 26th October, 1974, reported this historic event in a front page story that took up more space than the report on the closing day of the meeting held by the Synod of Bishops in Rome. The Grand Ulema of Saudi Arabia were afterwards received by the Ecumenical Council of Churches of Geneva and by the Lord Bishop of Strasbourg, His Grace Elchinger. The Bishop invited them to join in midday prayer before him in his cathedral. The fact that the event Was reported seems to be more on account of its unusual nature than because of its considerable religious significance. At all events, among those whom I questioned about this religious manifestation, there were very few who replied that they were aware of it. The open-minded attitude Pope Paul VI has towards Islam will certainly become a milestone in the relations between the two religions. He himself Mid that he was "moved by a profound belief in the unification of the Islamic and Christian worlds in the worship of a single God". This reminder of the sentiments of the head of the Catholic Church concerning Muslims is indeed necessary. Far too many Christians, brought up in a spirit of open hostility, are against any reflection about Islam on principle. The Vatican document notes this with regret. It is on account of this that they remain totally ignorant of what Islam is in reality, and retain notions about the Islamic Revelation which are entirely mistaken. Nevertheless, when studying an aspect of the Revelation of a monotheistic religion, it seems quite in order to compare what the other two have to say on the same subject. A comprehensive study of a problem is more interesting than a compartmentalized one. The confrontation between certain subjects dealt with in the Scriptures and the facts of 20th century science will therefore, in this work, include all three religions. In addition it will be useful to realize that the three religions should form a tighter block by virtue of their closer relationship at a time when they are all threatened by the onslaught of materialism. The notion that science and religion are incompatible is as equally prevalent in countries under the Judeo-Christian influence as in the world of Islam-especially in scientific circles. If this question were to be dealt with comprehensively, a series of lengthy exposes would be necessary. In this work, I intend to tackle only one aspect of it: the examination of the Scriptures themselves in the light of modern scientific knowledge. Before proceeding with our task, we must ask a fundamental question: How authentic are today's texts? It is a question which entails an examination of the circumstances surrounding their composition and the way in which they have come down to us. In the West the critical study of the Scriptures is something quite recent. For hundreds of years people were content to accept the Bible-both Old and New Testaments-as it was. A reading produced nothing more than remarks vindicating it. It would have been a sin to level the slightest criticism at it. The clergy were priviledged in that they were easily able to have a comprehensive knowledge of the Bible, while the majority of laymen heard only selected readings as part of a sermon or the liturgy. Raised to the level of a specialized study, textual criticism has been valuable in uncovering and disseminating problems which are often very serious. How disappointing it is therefore to read works of a so-called critical nature which, when faced with very real problems of interpretation, merely provide passages of an apologetical nature by means of which the author contrives to hide his dilemma. Whoever retains his objective judgment and power of thought at such a moment will not find the improbabilities and contradictions any the less persistent. One can only regret an attitude which, in the face of all logical reason, upholds certain passages in the Biblical Scriptures even though they are riddled with errors. It can exercise an extremely damaging influence upon the cultivated mind with regard to belief in God. Experience shows however that even if the few are able to distinguish fallacies of this kind, the vast majority of Christians have never taken any account of such incompatibilities with their secular knowledge, even though they are often very elementary. Islam has something relatively comparable to the Gospels in some of the Hadiths. These are the collected sayings of Muhammad and stories of his deeds. The Gospels are nothing other than this for Jesus. Some of the collections of Hadiths were written decades after the death of Muhammad, just as the Gospels were written decades after Jesus. In both cases they bear human witness to events in the past. We shall see how, contrary to what many people think, the authors of the four Canonic Gospels were not the witnesses of the events they relate. The same is true of the Hadiths referred to at the end of this book. Here the comparison must end because even if the authenticity of such-and-such a Hadith has been discussed and is still under discussion, in the early centuries of the Church the problem of the vast number of Gospels was definitively decided. Only four of them were proclaimed official, or canonic, in spite of the many points on which they do not agree, and order was given for the rest to be concealed; hence the term 'Apocrypha'. Another fundamental difference in the Scriptures of Christianity and Islam is the fact that Christianity does not have a text which is both revealed and written down. Islam, however, has the Qur'an which fits this description. The Qur'an is the expression of the Revelation made to Muhammad by the Archangel Gabriel, which was immediately taken down, and was memorized and recited by the faithful in their prayers, especially during the month of Ramadan. Muhammad himself arranged it into suras, and these were collected soon after the death of the Prophet, to form, under the rule of Caliph Uthman (12 to 24 years after the Prophet's death), the text we know today. Like Saint Augustine for the Bible, Islam has always assumed that the data contained in the Holy Scriptures were in agreement with scientific fact. A modern examination of the Islamic Revelation has not caused a change in this position. 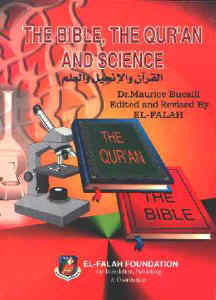 As we shall see later on, the Qur'an deals with many subjects of interest to science, far more in fact than the Bible. There is no comparison between the limited number of Biblical statements which lead to a confrontation With science, and the profusion of subjects mentioned in the Qur'an that are of a scientific nature. None of the latter can be contested from a scientific point of view. this is the basic fact that emerges from our study. We shall see at the end of this work that such is not the case for the Hadiths. These are collections of the Prophet's sayings, set aside from the Qur'anic Revelation, certain of which are scientifically unacceptable. The Hadiths in question have been under study in accordance with the strict principles of the Qur'an which dictate that science and reason should always be referred to, if necessary to deprive them of any authenticity. Scientists do not, for example, have even an approximate date for man's appearance on Earth. They have however discovered remains of human works which we can situate beyond a shadow of a doubt at before the tenth millenium B.C. Hence we cannot consider the Biblical reality on this subject to be compatible with science. In the Biblical text of Genesis, the dates and genealogies given would place man's origins (i.e. the creation of Adam) at roughly thirty-seven centuries B.C. In the future, science may be able to provide us with data that are more precise than our present calculations, but we may rest assured that it will never tell us that man first appeared on Earth 6,786 years ago, as does the Hebraic calendar for 1976. The Biblical data concerning the antiquity of man are therefore inaccurate. This confrontation with science excludes all religious problems in the true sense of the word. Science does not, for example, have any explanation of the process whereby God manifested Himself to Moses. The same may be said for the mystery surrounding the manner in which Jesus was born in the absence of a biological father. The Scriptures moreover give no material explanation of such data. This present study is concerned With what the Scriptures tell us about extremely varied natural phenomena, which they surround to a lesser or greater extent with commentaries and explanations. With this in mind, we must note the contrast between the rich abundance of information on a given subject in the Qur'anic Revelation and the modesty of the other two revelations on the same subject. It was in a totally objective spirit, and without any preconceived ideas that I first examined the Qur'anic Revelation. I was looking for the degree of compatibility between the Qur'anic text and the data of modern science. I knew from translations that the Qur'an often made allusion to all sorts of natural phenomena, but I had only a summary knowledge of it. It was only when I examined the text very closely in Arabic that I kept a list of them at the end of which I had to acknowledge the evidence in front of me: the Qur'an did not contain a single statement that was assailable from a modern scientific point of view. I repeated the same test for the Old Testament and the Gospels, always preserving the same objective outlook. In the former I did not even have to go beyond the first book, Genesis, to find statements totally out of keeping With the cast-iron facts of modern science. On opening the Gospels, one is immediately confronted with a serious problem. On the first page we find the genealogy of Jesus, but Matthew's text is in evident contradiction to Luke's on the same question. There is a further problem in that the latter's data on the antiquity of man on Earth are incompatible with modern knowledge. The existence of these contradictions, improbabilities and incompatibilities does not seem to me to detract from the belief in God. They involve only man's responsibility. No one can say what the original texts might have been, or identify imaginative editing, deliberate manipulations of them by men, or unintentional modification of the Scriptures. What strikes us today. when we realize Biblical contradictions and incompatibilities with well-established scientific data, is how specialists studying the texts either pretend to be unaware of them, or else draw attention to these defects then try to camouflage them with dialectic acrobatics. When we come to the Gospels according to Matthew and John, I shall provide examples of this brilliant use of apologetical turns of phrase by eminent experts in exegesis. Often the attempt to camouflage an improbability or a contradiction, prudishly called a 'difficulty', is successful. This explains why so many Christians are unaware of the serious defects contained in the Old Testament and the Gospels. The reader will find precise examples of these in the first and second parts of this work. In the third part, there is the illustration of an unusual application of science to a holy Scripture, the contribution of modern secular knowledge to a better understanding of certain verses in the Qur'an which until now have remained enigmatic, if not incomprehensible. Why should we be surprised at this when we know that, for Islam, religion and science have always been considered twin sisters? From the very beginning, Islam directed people to cultivate science; the application of this precept brought with it the prodigious strides in science taken during the great era of Islamic civilization, from which, before the Renaissance, the West itself benefited. In the confrontation between the Scriptures and science a high point of understanding has been reached owing to the light thrown on Qur'anic passages by modern scientific knowledge. Previously these passages were obscure owning to the non-availability of knowledge which could help interpret them.